This is one of the things I miss in our home: abundant foods, sharing and eating with my family. Unlike living alone in a dorm, I don’t need to think what to eat and where to buy. I need not to worry because one or two of my loving family members already made it for us. I don’t feel alone just eating by myself. My mother made meatballs when she asked me what I want. It was just in my mind when I want to eat chicken sopas, I was amazed when I woke up it was already there on our kitchen. 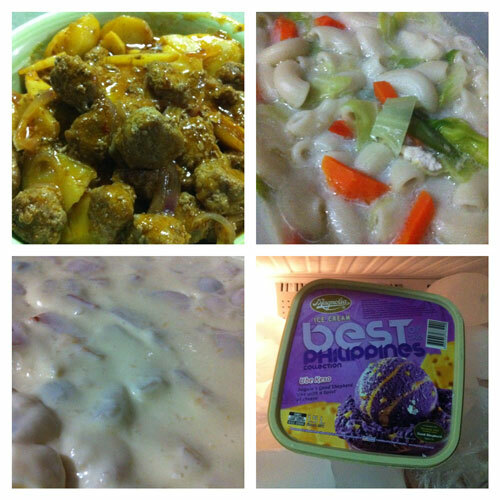 I made those yummy fruit salad (yes-that-is-fruit-salad) and I also bought that ube-keso ice cream for them. The kind of weekend I enjoy. This entry was posted in Daily Me, Food Corner and tagged food, home. Bookmark the permalink.